Does Dr No ever take a break from producing wacky pedal designs? It seems only a few weeks go by before another turns our collective head, and the latest to do the honours is the mind-blowing limited-edition SkullFuzz. Available in gold, silver, copper and black finishes, these snazzy skulls are the result of a collaboration with Dutch sculpture artist and guitarist Peter van Elderen, who originally built his version of the fuzz for Holland's RoadBurn festival, but is now offering it up as a short run. 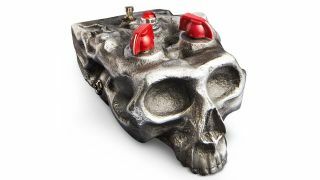 Each pedal on this limited run includes the original SkullFuzz's "insane, very versatile" tones - controlled via volume and fuzz controls plus a low/regular toggle switch - while its enclosure is made from fibre-strengthened casting material with a steel outside layer, making for a thick skull indeed. If you want one of these to stick on your pedalboard/mantlepiece, you'll need to act fast - just 24 of the pedals are available (six in each colour) from Dr No Effects for €389 apiece.